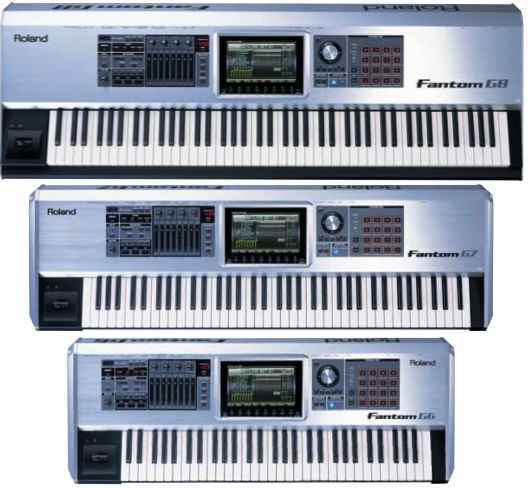 Roland has introduced three new keyboards in the Fantom-G range. The Fantom-G8 is a fully weighted 88 key instrument, while the Fantom-G6 features 61 synth keys and the Fantom-G7 features 76 synth keys, both with touch response and channel aftertouch. All three models boast Roland’s ARX SuperNATURAL expansion bay, colour LCD, 24 track audio/128 track MIDI recorder, twice the ROM capacity of their predecessors, and a new effects engine with mastering effects. They feature a maximum polyphony of 128 notes, 256MB of wave memory, 1,756 preset patches and 512 user patches, 73 preset and 64 user rhythm sets, and a maximum of 2,000 audio samples per project.